Bearing manufacturer Metallized Carbon Corporation is promoting its range of bearings for dry running in high temperature applications. The company says that its Metcar high temperature bearings are designed for use at temperatures ranging from 350 to 1000°F in oxidizing atmospheres, and from 350 to 6000°F in non-oxidizing atmospheres. At these high temperatures, oil-grease lubricated ball, roller, and sleeve bearings are problematic because the oil-grease lubricants can melt, volatilize or carbonize. Plastic and composite bearing materials can soften, deform or melt at such high temperatures. 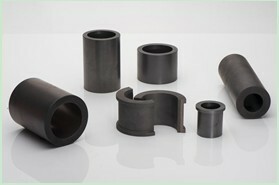 The company claims that because Metcar carbon-graphite bearings rely on graphite for their self-lubricating properties, they are not subject to the shortcomings associated with petroleum-based lubricants at elevated temperatures. They are dimensionally stable, and are not subject to melting, softening, or deformation. Metcar bearings can be used in continuous dryers, high temperature conveyors, kiln cars, and high temperature ventilation dampers. Also they are suitable for other high temperature equipment, including continuous bakery ovens, screw conveyors, valves, and paint dryers. Several Metcar Grades have received FDA approval for use in contact with foods and pharmaceuticals. Standard pillow blocks and flange blocks with Metcar bearing inserts are available with cast iron, stamped steel or stamped stainless steel housings. Metcar high temperature bearings are also available shrink-fitted into metal housings or metal retaining rings.